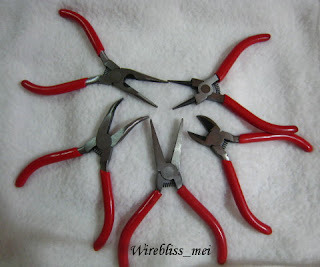 Today I am shwoing you tools that i have in my quest to create wire jewelry. This red set is my first set and its from Canada. Was so happy when my sis-inlaw took i back but later i discovered they are not that user friendly. I use the flat nose plier more often while the rest just sit in the box. This black set is a different story. This is a birthday present from beloved hubby last year just when I was starting out with this addiction of mine. 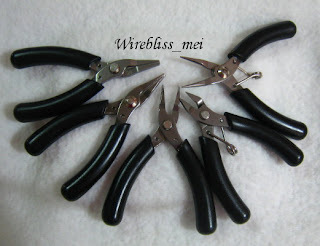 This is a mini set as the pliers are all mini size, about 4 in from one end to the other. So, I use them a lot when I am making pieces with finer wire - 22g to 26g. The flat nose, bend nose and long nose is my favorite as can be seen from the missing (broken) spring of these three pliers. All due to heavy usage. The cutter is a bit fragile due to its size and i dented it once when i tried it on memory wire. Big mistake and regretted it. Now I only use it for wire smaller than 23g.